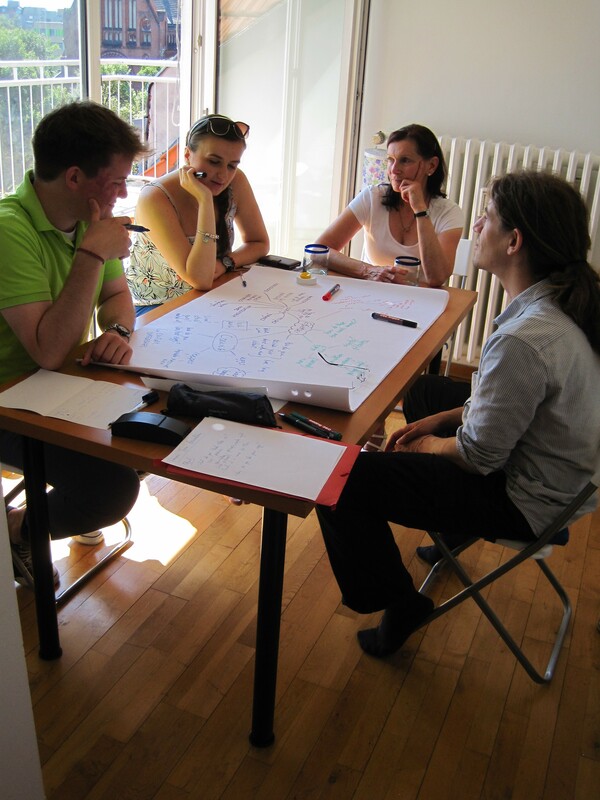 On 1st August 2015 the first international lesson jam took place. Four participants in Berlin were linked by Skype with seven participants in Cairo. 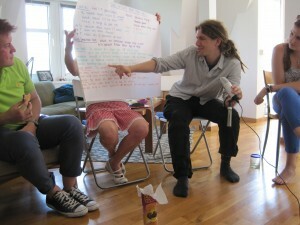 I hosted the Berlin end of the jam in my flat and Maha Hassan of Maha ESL Training organised the group in Cairo. The principles behind an international lesson jam are the same as a normal lesson jam taking part in one place. There is an even number of groups (in this case two) and they each follow five stages to creating a lesson plan in circa 3 hours (although we overran a bit!) The difference is that at the third stage the groups give feedback to one another via Skype and finally they present to each other via Skype. I was hoping that by linking groups from different contexts there would be even more potential for exchanging new styles, methods and techniques. Being the first lesson jam with Skype, I was anticipating technical problems and glitches that would need to be resolved in future jams. (For more on the technical aspect skip to the end). The session started a little behind schedule due to problems making the Skype connection, but once started the connection held for the duration. The groups initially introduced themselves and the stimulus that they had been given. The stimulus in Cairo was a mobile phone. The stimulus in Berlin was an egg piercer (more on egg piercers below!) I then explained the idea and schedule for the session. The groups then muted the volume on Skype and turned back to their own groups to work on the second stage, brainstorming the idea (for the first 3 minutes alone and then for the following 17 minutes as a group). 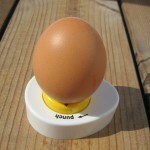 The egg piercer (Eierpiekser in German) is a utensil found in many German kitchens. It is used to pierce the shell of the egg before boiling. 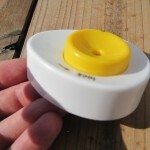 The egg is placed on the moveable (in this case yellow) section in the centre and then pushed down to pierce the shell on the pin in the centre. I chose this object as I expected that either the Berlin participants wouldn’t have seen one before or at least wouldn’t (as I don’t) know an instantly recognisable name for it in English. I had never seen one before moving to Germany. With its sharp spike, hidden by a moveable centre, it is an intriguing object even if you don’t know (and perhaps even more so if you don’t know) what it’s for. Due to its very ‘thinginess’ for English speakers (it’s difficult to put a name on it), I was hoping that it would provide an interesting stimulus. The egg about to be pierced. 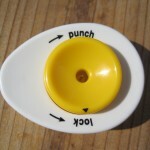 Punch or lock. 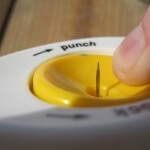 The egg-shaped egg piercer. The Berlin group hadn’t seen an egg piercer before. They guessed that it had something to do with eggs. I then explained its purpose. The group then brainstormed the object, writing down their ideas on the sheet of flipchart paper and talking about each others’ ideas. Meanwhile the group in Cairo were brainstorming ideas on mobile phones. After 20 minutes of brainstorming, the two groups linked up again via Skype for the third stage. The Berlin group explained their ideas to the Cairo group and asked for feedback from them. This lasted ten minutes. The roles were then reversed withe the Cairo group presenting their ideas for ten minutes. The groups took notes on the feedback offered by the other group. 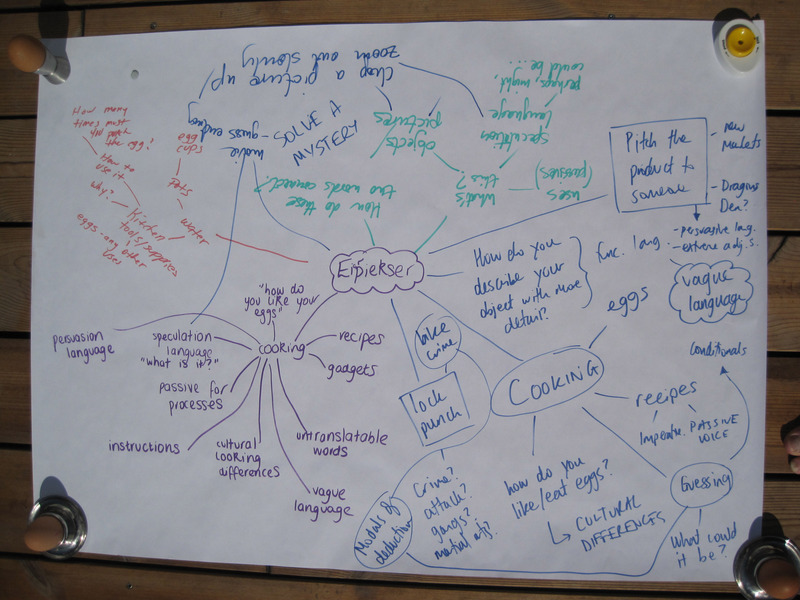 Some of the notes, for example ‘chop up a picture’, on the brainstorming sheet above resulted from the feedback given by the group in Cairo. 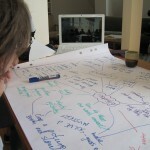 Berlin presenting brainstorm ideas to Cairo. Cairo presenting brainstorm ideas to Berlin. After the break each group continued alone without the Skype link to write up their lesson plan on the basis of their brainstorming and feedback from the other group. This lasted 45 minutes. 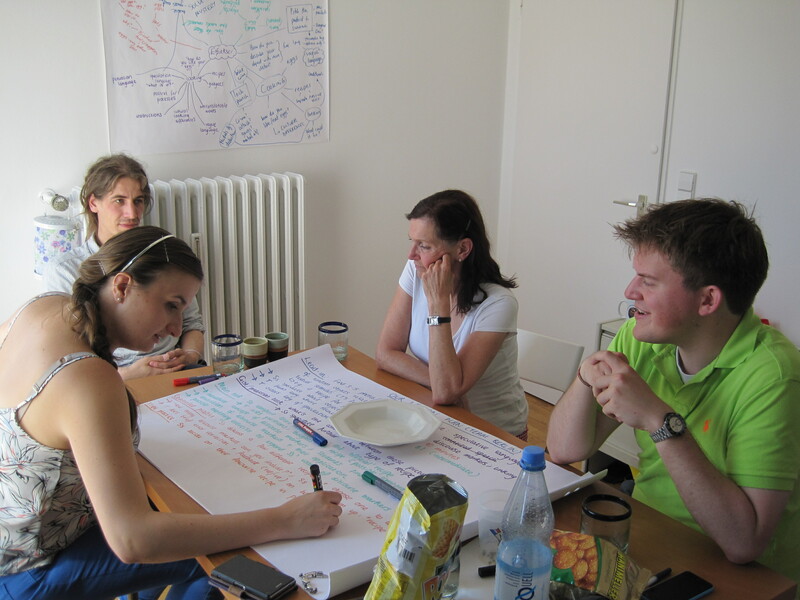 Writing up the lesson plan in Berlin. The brainstorm sheet is on the wall. Once the 45 minutes were up, the groups linked up again on Skype for the 5th stage and explained their lesson plans and asked each other questions about what they presented. The initial stimuli had developed in different ways. The egg piercer had all but disappeared from the Berlin group’s plan, whereas the mobile phone was still evident in the planning of the group from Cairo. An interesting discussion arose around the post-lesson evaluation of the effectiveness of lesson plans. The practice in Egypt is different from that in Germany in the sense that teachers in Egypt are required to evaluate the material learnt after each lesson. For the participants in Germany this is only a requirement at the end of each term, if at all. I haven’t had all the evaluation forms back yet, but initial feedback from both groups was very positive. I hope that such international lesson jams can take place again in the future. As the group was small for this first lesson jam via Skype, it took place in my flat. It meant that I was quite confident that the internet connection would work well. I could also put on some food and drinks easily. Very importantly it came at no cost. It seemed to work well and provide a relaxed setting. It also meant that I could fall back on some technical resources that I’m familiar with. The Skype connection worked. The two groups were able to communicate with each other and exchange ideas. It could have been better though and there are some lessons that I’ll learn. The speakers: my main worry before the session was that my computer’s inbuilt microphone would not be up to the job so I borrowed a microphone from one of the schools that I teach at. I didn’t think too much about the computer’s inbuilt speakers. For a group sitting further away from the computer than I normally do when speaking on Skype, the maximum volume was too low. It made it difficult (although not impossible) to hear the participants during the third stage feedback. For the presentations at the end I linked up the computer to my hifi which allowed greater amplification and made listening a lot easier. Next time I do a lesson jam via Skype I’ll use speakers as well as a microphone. The microphone: the microphone was multidirectional, which meant that it could be placed away from the participants and didn’t need to be passed around. It worked well most of the time, but at one point the computer reverted back to the inbuilt mic. We managed to resolve this problem fairly quickly. One at a time: I also realised that conversation via Skype only really works when one person is speaking at a time, otherwise understanding becomes very difficult. Next time I’ll bear this in mind with my group and pass it on to the partner group’s organiser. The picture: the image held up well throughout and the Cairo group had set up the camera well. 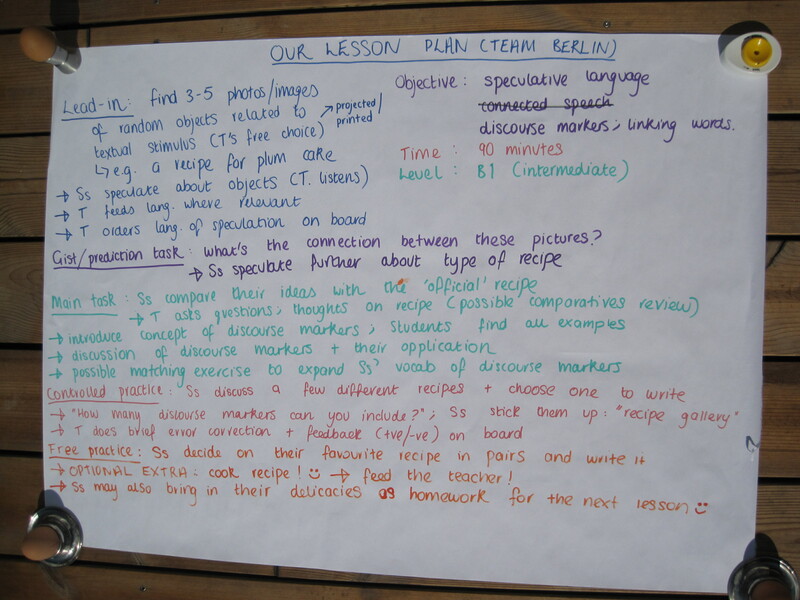 I still need to think about how to represent the flipchart brainstorm plans and end lesson plans better on screen. It might be better to send a photo of the plans just before the feedback and presentation stages. Any ideas welcome. Thanks to the teachers from Cairo and thanks to the teachers from Berlin who brought their creativity and teaching brains to the jam. Special thanks to Maha Hassan for all the organisation on the Cairo side. I had fun. I hope you all had a bit of fun too!